ISO-Base™ platforms are in use throughout the world protecting valuable IT Equipment. 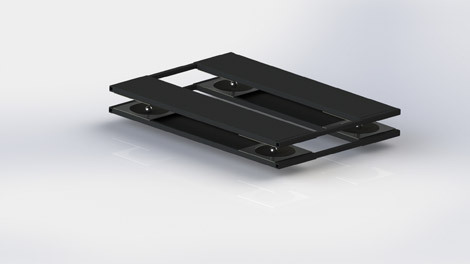 Its unique modular and patented plank design, allows the build-out of sleek low-profile rows for isolating all types server racks and IT equipment, in varying sizes and weights. An open “C” channel in the front and back of the plank design allows the user to move or change out equipment easily, and as needed. ISO-Base™ platforms can be installed in a “live” computer room since there is no drilling or anchoring required. The platform rows can be built-out with equipment rolled into position using ramps, or the racks can be hydraulically lifted straight up (about 5 inches), to allow the build-out of the platform, then lowered onto the platform. Original platforms feature a plank design with (2) bearing sets and in two widths. The 10.75” wide planks are traditionally used at the end of rows for a more concise fit. The 12.75” wide planks are used when two cabinets are sharing a plank in the middle of the built-out row. To accommodate equipment with unique footprints, two additional width planks are available, 14.75” and 15.75”. These wider width planks can be used in a mixed row of other width planks via the same “C” channel connectivity where more area is required to properly place the cabinets on a shared plank. Server racks and IT equipment has trended heavier in recent years, so to accommodate the increased weights, we offer Heavy-Duty ISO-Base™ planks with an additional bearing set to spread the weight load over more area. Heavy-duty planks are available in all widths and can be integrated into rows with other planks where needed. 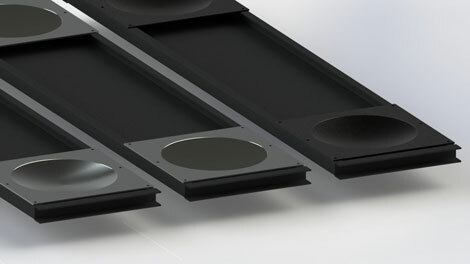 ISO-Base planks are available with two surface options. The ISO-Base system has available accessories such as ramps, and staging platforms, for loading on and off of built-out platform rows.